I’m sure that a few of you reading the title of this blog are scratching your heads, wondering what this one is all about. I promise you it’s not something weird! 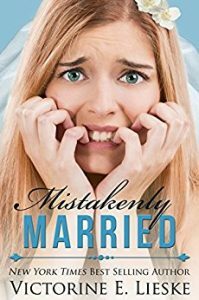 Mistakenly Married is actually a book! Let me share with you some things about it! Penny’s gotten herself into another one of her crazy messes. She’s broke and about to be evicted. When her online boyfriend suggests they elope, she agrees. Why not? She loves him, even though she hasn’t met him, so she blows the last of her cash on a fun Las Vegas wedding. Except, William stands her up and the limo driver picks up the wrong guy. A smokin’ hot wrong guy. Too bad she doesn’t find out who he really is until after the wedding. Harrison Williams needs a wife to gain access to his trust fund account. He goes to Las Vegas to meet someone, but there’s a mix up and he ends up at the Chapel-O-Love exchanging vows with Penny, a spirited girl in a cheap veil. When they realize the mistake, he convinces her to go back to Bel Air with him to prove that he’s married, and he agrees to pretend to be William so her family doesn’t have to know about her big mistake. Sounds like a good plan. What could go wrong? 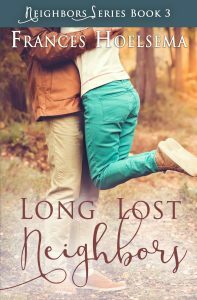 If you’re into clean romances, this book is a must read! It does say on the Amazon page that it is a romantic comedy, which for those of you who like that will appreciate it all the more. However, I don’t consider it a romantic comedy myself. There was nothing that really made me laugh. But that doesn’t mean the book wasn’t good! Quite the opposite, really. I think this book was great on many levels! I thoroughly enjoyed the character development and descriptive elements that were part of the story. Though the two main characters made a mistake, it was neat how they ended up falling in love with one another in the end. 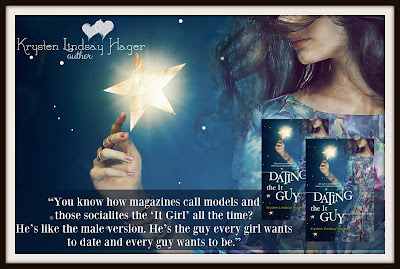 The build up of attraction and desire between the two was amazingly written! Although I loved the ending where the two do end up together, I wish the way the book got there was different. But that’s not something I would change the rating of the book for. It’s just a personal opinion. The ending it has is still good! Overall, Mistakenly Married is very well written! It was a fun, clean, and enjoyable read. I found myself wanting to read more each and every time I had to put it down! And, as a side note, I hear Victorine E. Lieske is kind of the queen of clean romance novels, having books on the New York Times and USA Today best sellers lists. So you know that this book is going to be good! I totally recommend reading if this is your sort of style! Who of you, by a show of hands, like to get things for free? I’m not talking about something broken or worthless or even something like a McDonald’s toy. What I’m referring to is something of value! Something you can actually use and enjoy very much! Even something that you could keep forever! Wouldn’t you love to have that “something” for free?!?!? I know I would! So……that’s what I’m giving! Let me explain. Saturday, March 25, is my 11th anniversary to my amazing husband. Though we’ve been married 11 years, we’ve known each other since 1994, making it 23 years of adventure, fun, and eventually love! For those that don’t know, my husband and I grew up across the street from one another. His family moved in back in 1994, and since then our two families have been united in one way or another. We were good friends then, and after doing some growing up, we are very much in love! Does that sound familiar to you? If it does, it’s because that is the storyline of my debut novel, Growing Up Neighbors! Being my first book and all, I wanted to write something I knew, and that was my own romance. So what does this have to do with free?!?! I’m getting there! 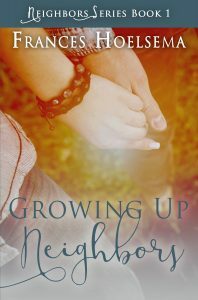 Because this weekend is my anniversary, and because this book is about my life, I am going to give away, to anyone who wants it, a FREE eBook copy of Growing Up Neighbors!! I have never given away a free novel before, but I figured this would be a good time to start! To get your free copy, just go to the Amazon website and order it. It won’t cost a single penny! You’ll be able to keep it for as long as you want obviously, and I really think that you’ll enjoy it tremendously. Do you like cats? If you’re like me, then Yes, Yes, a billion times YES! Those who know me know I grew up with cats and, except the year I lived in an apartment with my then newly wed husband, I have always had at least one cat. So I think it’s safe to say that to read about a cat would be up my alley. Not too long ago I came across a book by Lisa Shea called The Lucky Cat. 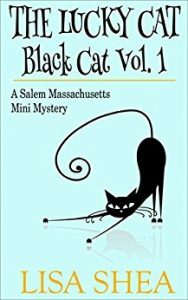 It’s part of the Salem Massachusetts Mini Mystery series that Lisa has, which if you like the history of that city, these books would be just the thing for you. I didn’t have a lot of time to read so The Lucky Cat was the perfect fix! AND, I do need to share that I kind of know Lisa Shea is a big name so I was excited to pick this one up and see what her writing was like! As of January 24, 2017, it has 76 reviews with an average of 4.3 stars! Kathy Taylor, a black female police officer turned private investigator, moved to Salem, Massachusetts; a town surrounded by wiccans, herbalists and the like. Her first client comes in looking for a stolen cat. This black cat had the power to help the client’s daughter get well from cancer. Now the cat is gone and the client’s daughter is getting sick again. Kathy takes on the case and quickly figures out what happened and why. The cat may be closer than you think and may have been taken for a very meaningful purpose. This is the purr-fect (see what I did there?) short read! 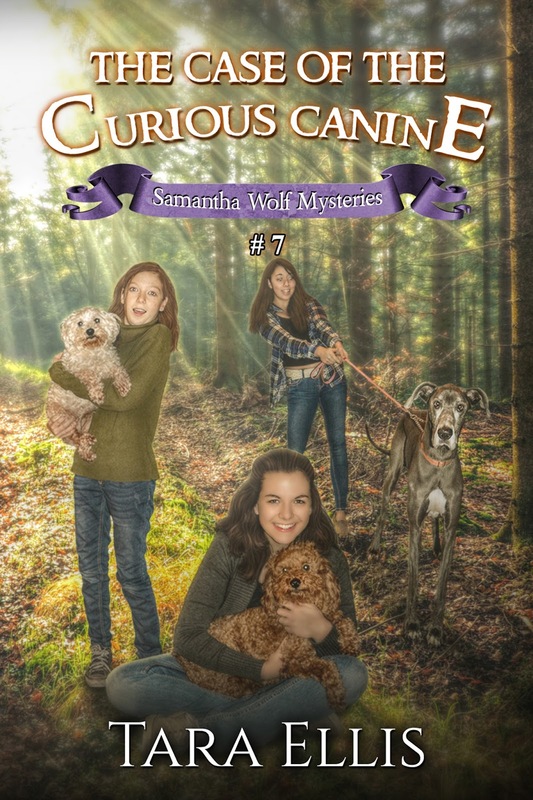 The mystery aspect was great as the author did a great job putting the pieces together. I think things were described well, and that this magical cat was sweet. I already have one black cat, but this nice mini mystery makes me want to get another! I rated this 5 out of 5 stars! I had a little bit of time to read something quick so I was happy to see a short story by Liwen Ho available that sounded fun. I “know” Liwen Ho from a Facebook group. I figured it must be good…and boy was it good! Let me tell you about it! Josh Pepper wants to be the next manager of the IT department – achievable until a new recruit, Cin Thomas, comes along. It’s his job to keep other men from getting distracted by her presence. Easy? He thought it would be until he got a whiff of her piercing green eyes, knowledge of IT and positive attitude. With their weekly games, growing friendship and cute banter, Josh isn’t sure he wants to be the next manager anymore as that would make it wrong for him to date Cin. A short trip down an elevator may get them literally stuck, but it helps them figuratively realize the best way to move forward. As of today it’s free! AND it’s #1 in the Kindle Store for Holiday books! 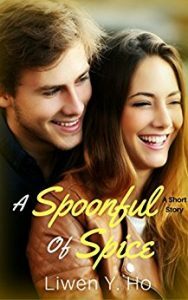 I gave A Spoonful of Spice: A Short Story by Liwen Ho 5 stars! Here’s why: Liwen did a great job describing the scenes in such a way that you felt like you were in them. All of the IT information was believable, and I feel Liwen wrote on that field well. 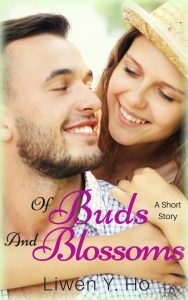 A nice thing about this short story is the blend of spices! Josh Pepper is the male lead character and Cin (short for Cinnamon) Thomas is the female lead character. On top of that, Liwen adds in fall beverages that just make you want welcome fall all over again, or try your best to run out and get a fall-flavored coffee! The ending is excellent, and I believe it was achieved in a believable way. I totally recommend this for anyone looking for a quick read. I have a series I want to eventually write where all four novels are going to be psychological thrillers, and what better way to learn about this genre than read books in this genre! 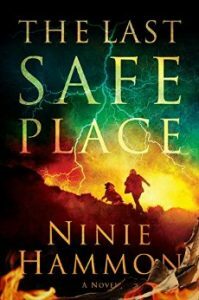 When searching for some popular stories, I came across The Last Safe Place by Ninie Hammon. -As of January 14, 2017, it has 924 reviews with an average 4.4 stars! It’s here! 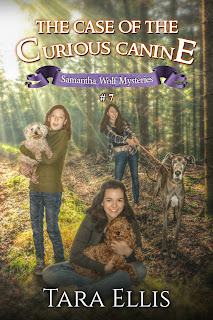 Book #7 in the Samantha Wolf Mysteries, and it’s a doggone good mystery! The next best thing to owning your own dog is having a job where you get to take care of them. That’s what Sam figures when she, Ally, and Cassy all volunteer at a local animal shelter. But they don’t expect the trouble that comes along with the work.